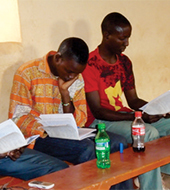 Theological works in the Gourma language are a valuable resource to the Church at large and particularly the Bible Schools. The Doulos Bible School has been collecting, translating and publishing materials for use internally, but there is a wider demand for these materials elsewhere. This project aims to reprint existing materials and develop new material for publishing and distribution in Burkina Faso.